1. Aletaha D, Neogi T, Silman AJ, Funovits J, Felson DT, Bingham CO, et al. Rheumatoid arthritis classification criteria: an American College of Rheumatology/ European League Against Rheumatism collaborative initiative. Ann Rheum Dis2010; 69(9): 1580-8. doi: 10.1002/art.27584. 2. Singh AK, Kalaivani M, Krishnan A, Aggarwal PK, Gupta SK. Prevalence of Osteoarthritis of Knee Among Elderly Persons in Urban Slums Using American College of Rheumatology (ACR) Criteria. J Clin Diagn Res 2014; 8(9): JC09-11.doi: 10.7860/ JCDR/2014/7763.4868. 3. Wolfe F, Smythe HA, Yunus MB, Bennett RM, Bombardier C, Goldenberg DL, et al. The American College of Rheumatology 1990 Criteria for the Classification of Fibromyalgia. Report of the Multicenter Criteria Committee. Arthritis and Rheumatism1990; 33(2): 160-72. 4. Branco JC, Rodrigues AM, Gouveia N, Eusebio M, Ramiro S, Machado PM, et al. Prevalence of rheumatic and musculoskeletal diseases and their impact on health-related quality of life, physical function and mental health in Portugal: results from EpiReumaPt- a national health survey. RMD Open 2016; 2(1): 2015-000166.doi: 10.1136/ rmdopen-2015-000166. 5. Davatchi F1, Jamshidi AR, Banihashemi AT, Gholami J, Forouzanfar MH, Akhlaghi M, et al. WHO-ILAR COPCORD Study (Stage 1, Urban Study) in Iran. J Rheumatol2008 Jul; 35(7): 1384. 6. Degli Esposti L, Favalli EG, Sangiorgi D, Di Turi R, Farina G, Gambera M, Ravasio R. Persistence, switch rates, drug consumption and costs of biological treatment of rheumatoid arthritis: an observational study in Italy. Clinicoecon Outcomes Res 2016 Dec 21; 9:9-17. doi: 10.2147/ CEOR.S108730. 7. Annemans L, Wessely S, Spaepen E, Caekelbergh K, Caubere JP, Le Lay K, et al. Health economic consequences related to the diagnosis of fibromyalgia syndrome. Arthritis and rheumatism 2008; 58(3): 895-902.doi: 10.1002/art.23265. 8. Knight T, Schaefer C, Chandran A, Zlateva G, Winkelmann A, Perrot S. Health-resource use and costs associated with fibromyalgia in France, Germany, and the United States. Clinicoecon Outcomes Res 2013; 5:171-80.doi: 10.2147/CEOR. S41111. 9. Haviland MG, Banta JE, Przekop P. Hospitalisation charges for fibromyalgia in the United States, 1999-2007. Clin Exp Rheumatol 2012; 30 (6 Suppl 74): 129-35. 10. Boonen A, van den Heuvel R, van Tubergen A, Goossens M, Severens JL, van der Heijde D, et al. Large differences in cost of illness and wellbeing between patients with fibromyalgia, chronic low back pain, or ankylosing spondylitis. Ann Rheum Dis2005; 64(3): 396-402.doi: 10.1136/ard.2003.019711. 11. Nadrian H, Moghimi N, Nadrian E, Moradzadeh R, Bahmanpour K, Iranpour A, et al. Validity and reliability of the Persian versions of WOMAC Osteoarthritis Index and Lequesne Algofunctional Index. Clin Rheumatol2012; 31(7): 1097-102.doi: 10.1007/ s10067-012-1983-7. 12. Rastmanesh R, Rabiee S, Shaabani Y, Mazinani H, Ebrahimi AA, Jamshidi AR. Validation of the Persian version of the Stanford Health Assessment Questionnaire (HAQ) in patients with rheumatoid arthritis. J of Paramedical Sciences (JPS) 2010; 1(1): 16-25. 13. Mobini M, Mohammadpour R, Elyasi F, Hosseinian A, Abbaspour S. Validity and Reliability of the Persian Version of Revised Fibromyalgia Impact Questionnaire in Iranian Patients with Fibromyalgia. J Mazandaran Univ Med Sci2016; 25(133): 119-27. 14. Maetzel A, Li LC, Pencharz J, Tomlinson G, Bombardier C. The economic burden associated with osteoarthritis, rheumatoid arthritis, and hypertension: a comparative study. Ann Rheum Dis 2004; 63(4): 395-401. doi: 10.1136/ard.2003.006031. 15. Gupta S, Hawker GA, Laporte A, Croxford R, Coyte PC. The economic burden of disabling hip and knee osteoarthritis (OA) from the perspective of individuals living with this condition. 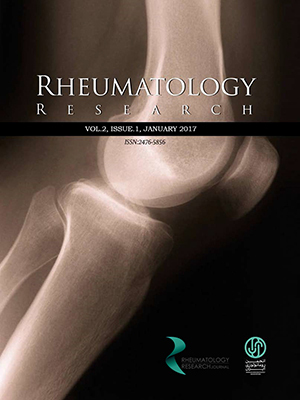 Rheumatology2005; 44(12):1531-7.doi: 10.1093/ rheumatology/kei049. 16. Kim SK, Kim SH, Lee CK, Lee HS, Lee SH, Park YB, et al. Effect of fibromyalgia syndrome on the health-related quality of life and economic burden in Korea. Rheumatology2013; 52(2): 311-20.doi: 10.1093/ rheumatology/kes255. 17. Jeffery DD, Bulathsinhala L, Kroc M, Dorris J. Prevalence, health care utilisation, and costs of fibromyalgia, irritable bowel, and chronic fatigue syndromes in the military health system, 2006-2010. Mil Med 2014; 179(9): 1021-9. doi: 10.7205/MILMED-D-13-00419.